For Ballet lovers this will be a unique experience. Walk around the main facilities of the “Alicia Alonso” Great Theatre of Havana escorted by a specialised guide. The tour within this recently restored majestic building will include the García Lorca concert hall, a video screening room and the “Origenes” Art Gallery. Appreciate some of the choices of the Cuban people to enjoy a better quality of life: good nutrition habits, consumption of natural products and exercising. Watch people practicing Tai-Chi and Chi-Kung at a beautiful park. Take a look at the so-called organoponicos; a system of urban organic gardens that consist of low-level concrete walls filled with organic matter and soil, very useful for growing vegetables in the city. Visit an agriculture & livestock market and a small lab where algae-based cosmetic products are elaborated. Lunch will be at Divino restaurant in a farm at 50 kms away from the city centre, where you could try some delicious and healthy recipes and receive firsthand information on their community projects. Try the flavours of Cuban and international cuisine at one of Havana’s restaurants. Meals are served on a set menu with one drink included. Retrace Hemingway`s steps in Havana in a day tour through the Nobel Prize`s favourite spots in the city. Visit the Vigia farm and Room 511 at the Ambos Mundos Hotel where he lived and wrote. Continue on for a panoramic excursion to the fishing village of Cojimar, the inspiration behind his novel, The Old Man and the Sea. Here a visit to La Terraza restaurant, a Hemingway`s regular choice is included, along with a stopover at his preferred bars in Havana, El Floridita and La Bodeguita del Medio. This tour offers the chance to gain a greater understanding of Cuba`s diverse religions and how their fusion plays a part in everyday life. Catholics, Afro Cubans, Protestants, Orthodox Jewish and Muslims all co-exist in Cuba. During this tour, travel to the other side of the bay to visit the Santuario de la Virgen de Regla and the Regla Religious Museum. Other sites featured are El Callejón de Hammel, a community project, the Religious Art Museum at Basílica Menor de San Francisco de Asis and the Greek Orthodox Church located on the grounds of the convent. A Synagogue Adath Israel and a Protestant Church are also included. Travel by road from your hotel to Pinar del Río Province through the spectacular Sierra del Rosario and stop for a short while at Cafetería Las Barrigonas to visit a small tobacco plantation. Visit a cigar factory in the city of Pinar del Rio and learn about the manufacturing process. Discover the beauty of Viñales and take in the spectacular views from Los Jazmines lookout. Spend some time touring the town of Viñales and Dos Hermanas valley. Amuse your eyes with the Prehistoric mural and board a boat that will take you along the underground river in the Indian cave. A typical Cuban lunch at a local restaurant is included. Get acquainted with this city by visiting several places of cultural and historic interest in the province. Start with the Castle of San Severino, one of the main bastions of the system of forts built in the 18th Century that now houses the Museum of the Slave Route. Step into the Triolet French drugstore, a world-wide unique pharmaceutical museum. See the venue of important cultural places such as Ediciones Vigía, El Retablo Gallery, and The Puppet`s theatre. Admire the wonderful view over the Yumuri Valley. Wander around the recently refurbished Ermita de Monserrate and El Morrillo Memorial, colonial Fort where the remains of Antonio Guiteras have been laid to rest. Later, continue on to Canimar to see a sample of indigenous history, one of the major archeological treasures of the island. Enjoy a welcome cocktail at Rancho Curujey and a short explanation of the Community Project before visiting Las Terrazas Community. Stroll along the Callejon La Moka and taste a Cuban cup of coffee. Visit the 19th Century Buenavista Coffee Plantation. Continue on to La Moka Hotel. Have lunch in one of the restaurants of the complex with the exception of La Casa del Campesino and El Romero which are not included. Enjoy some time swimming in the refreshing waters of Rio San Juan. Starting at your hotel, cycle around the streets of Centro Habana & Vedado until you get to Havana Harbour. Observe the Royal Force Castle and the remains of the city wall. Along the way, you`ll ride past National Hotel and the former Presidential Palace. 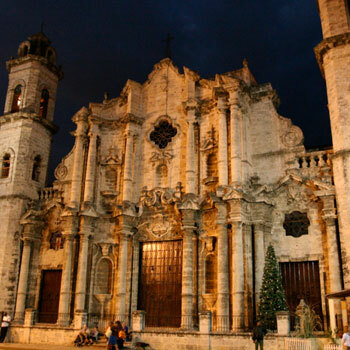 Explore Old Havana through its World Heritage`s colonial architecture and cobblestoned streets. The excursion will bring you to Plaza de Armas, Plaza de San Francisco de Asis, Plaza Vieja and Plaza de la Catedral. Wander through the small gift shops selling handmade souvenirs and photograph the magnificent buildings. Take a walking tour around Old Havana historical centre to discover the architectural beauty of this city. Your guide will take you to the main squares of the colonial area: Plaza de Armas, Plaza de San Francisco de Asis, Plaza Vieja and Plaza de la Catedral. Continue by taxi around the modern part of the city with various stops at some of their best attractions: The Capitol building, the Revolution square and the Hotel Nacional de Cuba. Drive along former residential neighborhoods Vedado and Miramar to appreciate different architectural styles. Entrance to one Museum is included. Discover Old Havana from a comfortable and an elegant horse-drawn carriage. This colonial-style tour will take you along the outskirts of Old Havana, including Havana`s port, Capitol Building, Central Park, Prado Promenade and Revolution Museum (former Presidential Palace). The journey includes a walking tour through Old Havana`s historical centre, Plaza de Armas and Plaza de San Francisco de Asís. Enjoy a panoramic city tour through modern Havana. Travel through neighborhoods such as Central Havana, Vedado and Miramar. You will ride past the Capitol Building, Revolution Square and the University of Havana among others. Entrance to one Museum is included as well as a complimentary drink at Hotel Nacional where there will be a stop for taking photos . There is a supplement for vintage car. Gain a greater understanding of Cuba`s diverse religions and how their fusion plays a role in everyday life. Catholics, Afro Cubans, Protestants, Orthodox, Jewish and Muslims all co-exist in Cuba. Travel to the other side of the bay to visit the Santuario de la Virgen de Regla and the Regla Religious Museum. Other sites featured are El Callejón de Hammel, a community project, the Religious Art Museum at Basílica Menor de San Francisco de Asis and the Greek Orthodox Church located on the grounds of the convent. A Synagogue -Adath Israel- and a Protestant Church are also included. Retrace Hemingway’s steps in Havana in a half-day tour through the Nobel Prize’s favorite spots in the city. Visit the Vigia farm and Room 511 at the Ambos Mundos Hotel where he lived and wrote. Continue to the fishing village of Cojimar, the inspiration behind his novel The Old man and the Sea. Enjoy a cocktail at Las Terrazas de Cojima restaurant, a Hemingway´s regular choice is included. Walk a few blocks till the Fort to see Hemingway´s bust sculpted from the melted down propellers donated by local fishermen. 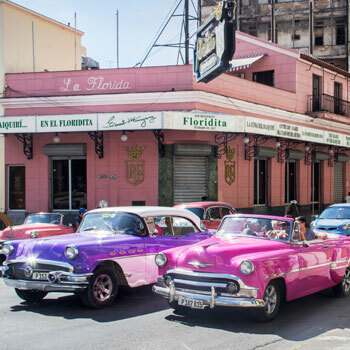 A stopover at his preferred bars in Havana, El Floridita and La Bodeguita del Medio are also part of this tour. Try a superb à la carte meal at one of the best restaurant in Havana “Café del Oriente” where food is prepared with a special touch. Meals include two drinks: a bottle of water and a glass of wine. "Learn about the history of cigars, its origins and varieties before witnessing the master cigar roller rolling a proper habano while explaining the particulars. Afterwards, you will learn how to choose a cigar by its strength and aroma. Enjoy a tasting or blending event with two cigars accompanied by a selection of Cuban rum in one of the following options: 1. 2 cigars accompanied by a cup of Espresso coffee and a shot of Cuban mature rum. 2. A cigar accompanied by 2 types of Cuban mature rums and a cup of Espresso coffee. 3. 2 cigars accompanied by 2 mature rums and a cup of Espresso coffee. Depart from Havana directly to Viñales to visit the place where tobacco leaves are fermented, sorted and dried before being taken to the warehouse. Witness the whole process, which is one of the first stages of cigar production. Then, start to walk through the Valley of Silence for about 8 kms. On the way, visit a farmer house to try a delicious Cuban coffee and some fruit (included!) while you learn about Cuban farmers’ way of life. Here you will also see a tobacco plantation, the drying process and the sorting area. While unveiling this trail amongst haystack hills, appreciate the diverse and beautiful flora and fauna of the area. Arrive to the base of the Cocoloco viewpoint. Visit to the 20-metre length Monkey´s cave, a wide and well-ventilated cavern. Take a bath in the dam to refresh. Enjoy a typical lunch at the ecologic restaurant El Paraiso with one drink included before returning to Havana. Explore the unspoiled nature and luxuriant tropical vegetation of the Zapata peninsula. Visit Cuba`s largest crocodile breeding farm at Boca de Guama. Continue to the Treasure Lake where you will get on boat and enjoy a 20-minute trip to the Indian Village, a reproduction of a Tainos (Cuban native Indians) community with 25 life-size statues captured in their daily activities. The tour resumes to the Bay of Pigs with a drive along this scenic part of the Caribbean coastline while enjoying the great views of the beaches Playa Larga and Playa Giron. A visit to the small Museo Giron is included, where photos, documents, weapons and the wreckage of aero planes that took part in the Anti-Castro invasion are on display. A typical Cuban lunch is included. Arrivals: Clients will be expected by an airport staff member with a sign with his/her name on it. They will be escorted to Immigration Desk, where they will have priority over the queue as well as for hand luggage check-in. Then clients are guided to the VIP lounge where there is open bar and some snacks, while the staff member retrieves client’s luggage and finally escorts clients towards the exit of the airport. Departures: Clients are expected by an airport staff member and guided towards check-in where they have priority as well as at the Immigration Desk. Then, clients are escorted to the VIP Lounge where they could wait while enjoying the open bar and some snacks. Enjoy a night out at Café Taberna Beny Moré in the heart of the old town, listening to the music of a great band reminiscent of the 1950`s music. Excellent dancers accompany the band to let you have a glimpse into Cubans great dancing skills. Enjoy the beauty of the capital city at night. Appreciate the importance of the seafront for locals as you ride all along it on a vintage car for an hour till you arrive to La Cabana fortress just in time to witness one of the most typical Havana traditions: The Cannon Shot Ceremony. Afterwards, you will be taken to a private restaurant (or paladar) to try some of Cuba’s delicious dishes with one drink included. Continue to enjoy nightlife in Havana at a bar in Old Havana with 2 drinks included. You may choose the one you prefer or you could ask your guide for suggestions. At midnight, after sipping a couple of Mojitos or Cuba Libres accompanied by your guide, he/she will take you back to your hotel. Visit Callejón de Hammel, a street famous for a colourful 200m mural that pays homage to the Afro-Cuban culture and religion. The street has small shops selling handcrafted religious objects and on Sundays, it becomes the venue for rumba shows. Afterwards, continue to an Art Gallery, where you could admire and/or buy some pieces of Cuban art. A visit to Havana`s biggest hand-crafted market is also included. Appreciate the eclectic architecture of this city with a panoramic tour along Prado Promenade and other streets with wonderful examples of the Cuban versions of Art Deco, Art Nouveau, neo-Classic and neo-Gothic architecture. Continue to Vedado, where modern city planning includes the FOCSA building and the López Serrano edifice. Visit the Art Deco former residence of Doña Catalina Laza, the Casa de La Amistad. Resume your trip onwards to Miramar and view residences from the 40`s and 50`s nestled alongside contemporary buildings. Stop at La Maison and from there continue to view a scale model of the city. On your way back, you will be able to see some of the fortresses in Old Havana as well as a sample of the colonial architecture of this part of the city. Starting at your hotel, your guide will take you to the main squares of the colonial area: Plaza de Armas, Plaza de San Francisco de Asis, Plaza Vieja and Plaza de la Catedral. After tasting a Cuban cocktail you will be driven in a vintage car through the modern part of the city. Along the way you`ll ride past Revolution Square, the University of Havana, National Hotel, Capitol Building and the former Presidential Palace. Move your hips and feet at the pace of Cuban music for 90 minutes with the assistance of a qualified instructor in Old Havana. Arrive to “Vista Hermosa” Farm, situated in the municipality of Guanabacoa. A local guide will welcome you while you will be able to taste some locally grown fruit. You will tour around the farm where you will see different crops and breeding of rabbits, pigs, cows and different types of fowl. A small factory for cheese and cold cuts could be seen from the outside as hygiene measures forbids people entering without being disinfected. Afterwards, you will be taken to climb a small mountain from where a beautiful view of the entire farm could be admired. For those who like horse riding, this is a nice place to fancy yourself. A snack based on products produced at the farm and one drink is included. Enjoy a night out at Café Taberna Beny Moré in the heart of the old town, listening to the music of a great band reminiscent of the 1950`s music. Excellent dancers accompany the band to let you have a glimpse into Cubans great dancing skills. A set menu meal is included with two drinks. Live from 9 pm to 2 am, one of the most outstanding artistic spectacles of Havana at Cabaret Parisien where stories of good music, dancing, illustrious visitors, mobster plots and outstanding choreographies tell by themselves. It includes one drink. Learn about the origins of tobacco, how it is grown, produced and exported in Cuba in a cigar factory. Here, you will be able to visit the galley, where skillful rollers will show you how to shape cigars from a wide variety of leaves. You will be also witness of one of the rarest professions of all, the cigar factory reader. Round trip transfers are included on the price. Learn about Cuban rum and its relation to the Cuban people, both past and present by discovering how rum is processed, from when it`s first harvested as sugar cane right up to the moment when the rum touches your lips. Visiting the Havana Club Foundation, which recreates a traditional rum factory, will give you an opportunity to taste Cuba`s unique rum and understand why it has won so many international awards. Try a delicious meal at a private restaurant or paladar where international and Cuban food is prepared with a special touch. Meals are served on a set menu comprising two drinks (drinks may include a glass of wine or beer at most paladares). Enjoy dancing with a qualifid instructor that will take you to one of the best places to dance in the city. At the end, the instructor will take you back to your hotel. This could be a perfect complement for clients that have taken salsa lessons in the afternoon so they could put into practice what they have learned and improve their dancing skills. Located on the 25th flor of the Tryp Habana Libre hotel, this nightclub is the perfect place to listen to and dance Cuban music with one drink included. Each night a popular band will play and afterwards, you may enjoy of recorded music to continue to dance till 03:00 hrs. 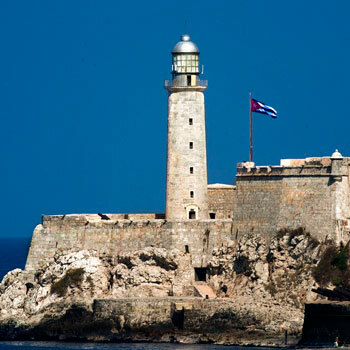 After being taken to El Morro Castle, which construction was concluded by the end of 1700s, start strolling around to learn about the history of this marvelous castle, its architecture and diffrent purposes throughout time. 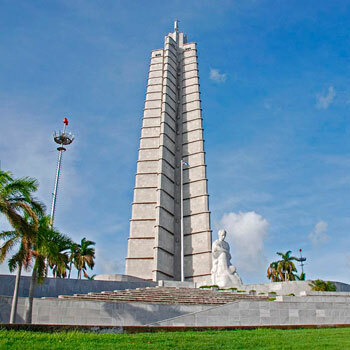 Located on the northern side of the Revolution Square, this 358 feet star-shaped tower features two rooms of correspondence and items from the life of José Martí. A third room illustrates the history of the Plaza de la Revolucion, and a fourth room is used for displays of contemporary art. The centre of the tower houses the elevator that takes visitors to the look-out point with a magnifient view of the city of Havana. Enjoy of a superb show of Cuban music and folklore under de stars, at Salón Bajo las Estrellas (The Hall under the Stars), Tropicana. Included with the tour is a quarter of bottle of Havana Rum, tonic water or cola, hors d`ouvres and a glass of sparkling wine. Copyright © 2006 - 2019. latinamericatravelcuba.com. All Rights Reserved.